On this radio show we discussed starting a business. And developing it’s future. Some of the things we wanted to hear from our experts were, how do you go about researching your market – identify potential customers? Developing and planning then testing your product or service with real customers? Find partners and suppliers and think about who you’re going to work with to develop and sell your idea? And what about keeping accounts? How, and what does a new business need to do? We wanted to know about promoting a business through the different communication channels that includes things like face-to-face communication, print media such as newspapers, magazines, fliers, and newsletters, broadcast media such as radio and television, and electronic communication such as websites, social media and email. The individual interview highlights are now available on podcast further down the page. Owner of Concise Training specialising in offering IT training that the client wants in a way that makes it affordable and appropriate for the client. Mary has worked with IT for over 20 years and have been training adults for 7. Mary started Concise Training as she is passionate about helping people to use their IT in the most cost effective way possible. Training courses are developed for individuals to ensure that they learn what they don’t already know. Mary began Concise Training by offering Microsoft Office training but quickly moved into Social Media marketing training because she has seen how successfully it can be used by Concise Training and by their clients. Mary has also created learning resources for the Level 1, Level 2 and Level 3 Social Media apprenticeships. Hear the full radio interview with Mary. A cheerful, enthusiastic, “qualified and quirky” Chartered Accountant, who speaks two languages fluently – accountantese and plain English. Emily has a reputation of translating small business finance and tax into practical sensible plain English. Emily is FreeAgent Chief Accountant. Always known as M.
After graduating from the University of Cambridge, Emily trained and qualified with growing accountancy practice Cannon Moorcroft, where she looked after accounts and tax for a portfolio of micro-business clients. This gave her a keen interest in accounting software and training, which led to starting up her own business making screen-capture tutorial videos, and later to joining FreeAgent, where she works with worldwide small businesses to help them use this simple online accounting system to keep their books in real time. Emily is passionate about helping the owners of small and growing businesses to escape their fear of “the numbers”, and believes that, with the right tools and guidance – some of which she aims to provide in this book – absolutely anyone, even if they were hopeless at maths at school, can learn to look after the finances of a small business. Hear the full radio interview with Emily. Known to his customers as the Print Marketing Mentor. His Tagline: My passion is Marketing and I want to learn more. Printing and Mailing is a print management company founded in June 2001. 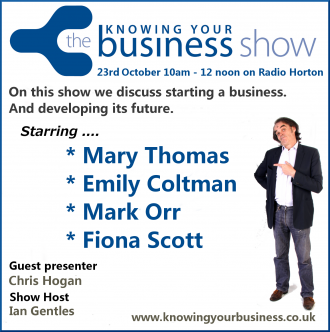 Mark is also the Chairman of the Milton Keynes Business Growth Club. The Business Growth Club has developed from a traditional weekly networking group into something of far more value. The timed sales pitches have been replaced by informal presentations that we expect other people around the table to interact with. The meeting is very conversational like a mastermind group. Hear the full radio interview with Mark. In the mid-1990s Fiona moved into television working for HTV in Bristol (now TV West) working up from researcher to series producer working on current affairs, factual entertainment and on commissions for Teachers’ TV. Fiona had her own series and ideas commissioned. Fiona also writes regularly for the Gazette & Herald in Wiltshire, Swindon Advertiser and Wiltshire Life magazine. She is currently a director on BBC daytime show Flog It! and a guest producer director for ITV Wales on its current affairs series Wales This Week. Fiona also worked on the One Show, sourced stories for Red Nose Day 2011 and 2013 for Comic Relief. Hear the full radio interview with Fiona. 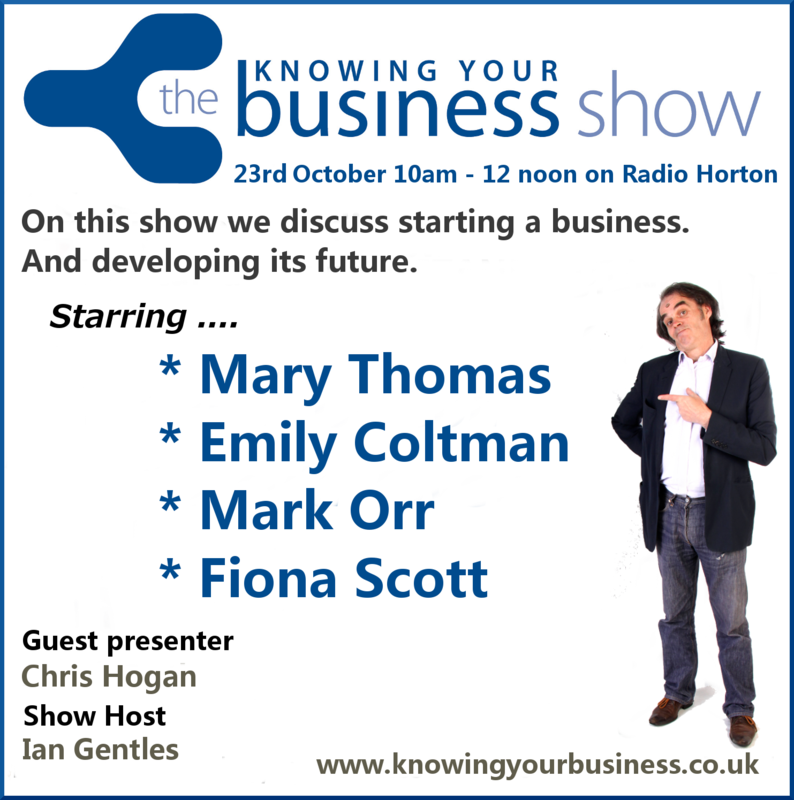 Knowing Your Business Radio Show time is broadcast every Thursday from 10 am until 12 pm on Radio Horton.